This section is always work in progress and any contributions and/or corrections would be most welcome. The image above is of East Lodge in 1885. The Archive Group was formed to collect and collate historical and contemporary photographs and memorabilia about the Estate, particularly from the time of the Allhallows School through to the current time. If you have any artifacts, from any period, which may be of interest or if you are interested in participating, helping or otherwise encouraging this great enterprise, please contact the Group by email at rousdonarchives@gmail.com. Current members of the Group are: John Rose (Chair), Christine Barradell (Secretary), Anne Fleming, Sidney Gibson, David Tollafield and Roy Jones. The earliest records begin in the early part of the 12th century. See St Pancras Church. In 1086 the Domesday Book records "Odo holds Rousdon. Matilda held it before 1066. It paid tax for one virgate (about 30 acres) of land. Land for two ploughs, which there are, with 1 villager, six smallholders and two slaves. Meadow, two acres; pasture, 3 acres; 15 sheep; 11 goats. Value formerly and now 20 shillings." ROUSE DOWN, formerly RALPH DOWN (or Doun-Ralph), and sometimes called St. Pancras, was, as early as the reign of Henry II (5 Mar 1133-6 Jul 1189), in the ancient family of Downe, one of whom, Ralph de Donne (or Downe or Doune c1244-1325) who inherited the property from his father, gave the name, now corrupted from Ralph to Rouse, to the parish. Hugh de Doune held the estate at his death in 1407 but his male line died out with him and the estate was divided between his two daughters. One of the coheiresses of Doune brought her part of the estate, then of some 200 acres, to the Holcombes, who possessed it for six generations. Gilbert Holcombe (1565-1633), the last of this family, sold it to the Mallocks, in whom it continued for many generations. The Mallock family had its origins in East Devon and the family fortunes were laid by Roger Mallock (died 1651) who purchased the manors of Broadclyst, Smalridge (Axminster, Devon) and Fiddington (Somerset) in the 1640s. He obviously attained considerable wealth and influence in Exeter, being elected a member of the Corporation in 1625, City Sheriff in 1631 and Mayor in 1637. It was his son, Roger, who purchased Cockington, near Torquay, from the Royalist, Sir Henry Cary (1634-1663) in 1654. During the 17-19th centuries, the Mallock family produced Members of Parliament, Justices of the Peace, clergymen and attorneys. By 1822 the estate was the property of Robert Chick Bartlett, Esq (possibly a Clerk for the County of Devon). See Reference British History Online. By 1872 the property had passed to The Reverend Thomas Bradford Bartlett. "ROOSDOWN, an extra-parochial chapelry in Axminster district, Devon; on the coast, 4 miles south of Axminster railway station. Post-town, Axminster. Acres, 200; of.which 10 are water. Population, 13. House, 1. The land lies high; belonged formerly to the Downe family; and belongs now to the Rev. T. B. Bartlett. The living is a rectory in the diocese of Exeter. Value, £35 per annum. Patron, the Rev. T. B. Bartlett. The church is in ruins." See Vision of Britain. See a reference to Ralph de Doun in Images from an extract from the "Worthies of Devon" by John Prince (1643-1723), Vicar of Totnes and Berry Pomeroy. The Peek Baronetcy, of Rousdon in the County of Devon, is a title in the Baronetage of the United Kingdom. It was created on 13 May 1874 for Henry Peek. He was an importer of spices, tea and other groceries, a philanthropist and Conservative Member of Parliament for Surrey Mid (1868-1884). Rousdon Estate was sold out of the family in 1937 and the family connection largely ceased. 1st Bart of Rousdon, Devon. Senior M.P. for Mid-Surrey (1868-1884). First Chairman of the Commercial Union Assurance Co. His portrait was in the Board Room at Peek House, 20 Eastcheap, City of London, where he was a partner in Peek Brothers & Co. from 1847 and senior partner until 1895. He was created a baronet on 13 May 1874 and lived at Wimbledon House, co. Surrey, from about 1860 onwards. In 1872 Sir Henry purchased the village of Rousdon where he rebuilt the church and village school and commissioned the eminent architect of the day, Ernest George (who also built Southwark Bridge and among Sir Ernest's pupils was the even more famous architect Sir Edwin Lutyens), to design and build a Mansion that took full advantage of its position some 500 feet above the sea. The house was completed in 1878 at a reputed cost of £250,000 (approximately £13 million in today's money, See National Archives Currency Converter). As it was some distance from the town the house had to be totally self-sufficient, it boasted laundry, coach houses, harness rooms, wine cellars, bowling alley, rifle range, china stores, bake houses, larders, museum, observatory, walled garden, tennis courts, farm buildings and numerous cottages to house the Estate population, which at the end of the 19th Century extended to about 600. Sir Henry Peek was a governor of Holloway prison and many of the floors were inlaid with mosaics created by the inmates. Sir Henry's famous collection of stuffed birds reputedly had an example of every bird native to the British Isles. The founders of the family firm were the brothers James (Sir Henry Peek's father), Richard (3 Oct 1782-7 Mar 1867) and William Peek (20 Nov 1791-14 Sep 1870) of Loddiswell, in Devon. .
Having come to London and gained experience of the tea trade, William launched W Peek and Company, tea merchants, circa 1818. By the 1820s, Richard and James had joined the concern and it was renamed Peek Brothers. Peek Brothers were principally engaged in the tea trade, although they handled coffee and spices as well and manufactured cocoa and chocolate. In 1834, William moved to Liverpool and launched a new enterprise with a new partner named Winch. Eventually, control of the firm was assumed by William's son Francis and by Winch's nephew, under the name Messrs Peek Brothers and Winch (later Francis Peek, Winch and Company). In the 1860s, they opened a branch in London in direct competition with the original Peek Brothers. Between 1863 and 1867, the Grocer published league tables of the leading firms of tea dealers based on the amount of duty each paid; Peek Brothers was the premier company, handling around 5% of the total trade and Messrs Peek Brothers and Winch were also listed in the top four. The two Peek firms were reunited in 1895 and became a limited company, under the name Peek Brothers and Winch Limited. The headquarters of Peek Brothers and later Peek Brothers and Winch Limited, was Peek House, 20 Eastcheap, which still stands today, complete with a frieze on its facade depicting the camel train used as a trademark for the company's "Camel" brand of tea. The company continued trading until circa 1970, under the name Peek, Winch and Tod Limited, although no longer involved in the tea trade and described in trade directories as general provision merchants. In about 1845 William Peek's eldest daughter, Mary (31 Mar 1821-1896), married George Smith Drew (1819-1880), an English clergyman and son of a London tea dealer. The 6th of their 8 children was Julius Charles Drewe (1856-1931). He was the owner and founder of Castle Drogo. Julius Drewe initially worked for his uncle, Francis Peek for the firm of Peek Brothers and Winch as a tea buyer, spending a great deal of time in China. He went on to create Home and Colonial Stores, once the United Kingdom's largest retail chain. In 1889, at the age of 32, he was wealthy enough to permanently retire from active business. In 1919 he and his partner, John Musker, sold their shares in the business for £3.5 million (c£193 million today). In 1931 Home & Colonial took over Liptons. In 1961 the firm became Allied Suppliers. In 1972 it was taken over by Cavenham Foods (Sir James Goldsmith). In 1982 it was taken over by Argyll Foods. In 1987 Argyll merged with Safeway UK. In 2004 Safeway UK became part of Morrisions. Peek, Frean and Co was established in 1857 in Bermondsey, London by James Peek (Sir Heny Peek's father) and George Hender Frean (9 Feb 1824-16 Oct 1903). On 15 Jun 1853 George Frean married Hannah Peek (1829-1898, Sir Henry Peek's niece), daughter of Samuel Peek (8 Mar 1785-25 Dec 1860, Sir Henry Peek's uncle). Sir Henry was a director during part of the late 1800's. In 1861, the company started exporting biscuits to Australia and later to other overseas destinations. They moved to a larger plant in Bermondsey in 1866 where they continued baking until the brand was discontinued in 1989. In 1861, they introduced the Garibaldi biscuit. In 1910, the company introduced their first cream sandwich biscuit, now known as a Bourbon biscuit. In 1906, the Peek Frean and Co factory in Bermondsey was the subject of one of the earliest documentary films shot by Cricks and Sharp. In 1921, Peek Frean entered into an amalgamation agreement with rival biscuit firm Huntley and Palmers, resulting in the creation of a holding company, Associated Biscuit Manufacturers Ltd. However, both biscuit firms retained their own brands and premises. There were no Peeks involved in the business after 1900. The firm ultimately became part of Kraft Foods. The fact that we can all enjoy the freedom of Wimbledon Common is largely down to Sir Henry. 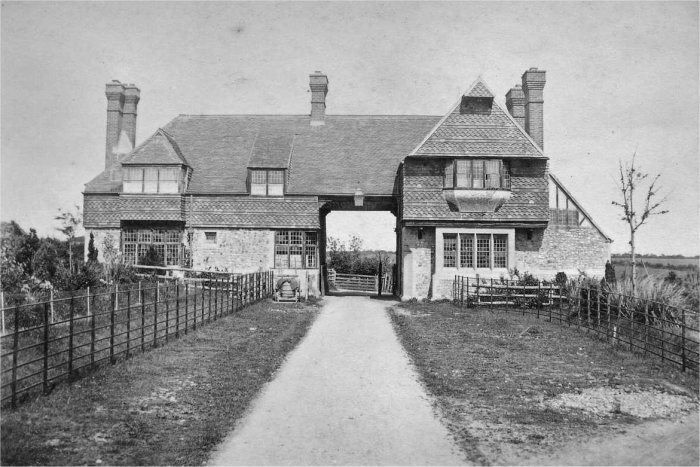 In November 1864, Earl Spencer, Lord of the Manor of Wimbledon, called a meeting of local residents where he put forth a proposal that 700 acres of the common be enclosed (forming a park), that a couple of acres be set aside so that he could build himself a large house (near the site of the present day windmill) and that 300 or so acres be built upon. Citing the 'noxious mists and fogs' and nuisance 'gypsies' as the main reason for him wanting to create this bill, he presented it to a largely sympathetic Parliament. However, the proposal was opposed by a Select Committee whose interest it was to investigate green open spaces around urban London. Sir Henry Peek, who established and chaired the Wimbledon Select Committee, went head to head with the Earl, eventually forcing him to come to a compromise and the Wimbledon Common Conservators were born. They maintain and keep the Common open to this day and a memorial to Sir Henry stands at the site of Caesar’s Well. Sir Henry was also instrumental in the saving of Burnham Beeches. In 1879 Burnham Beeches came on the market, advertised as land suitable for building 'superior residences'. A prominent naturalist, Francis George Heath (1843-1913), tried to enlist support for saving the area with its magnificent trees and persuaded the Corporation of the City of London to act. A new law, the Open Spaces Act of 1878, allowed the Corporation to buy unenclosed and common land on the edge of London. However, there was a complication: there were two enclosed areas in the middle of the common land. This was solved by the local MP, Sir Henry Peek, who bought the entire lot and then sold the unenclosed parts on to the Corporation. One condition Sir Henry did insist upon as part of the agreement was that the Corporation pay for roads to be built to allow him access to the land he retained and these roads are named after people involved with the Corporation at that time. Since then, the enclosed areas have been either given to or bought by the Corporation so it now owns the whole of Burnham Beeches. An amateur astronomer and meteorologist, born at Wimbledon on 30 Jan. 1855, was only child of Sir Henry Peek. His mother was Margaret Maria, second daughter of William Edgar of Eagle House, Clapham Common. Cuthbert, after education at Eton, entered Pembroke College, Cambridge, in 1876 and graduated B.A. in 1880, proceeding M.A. in 1884. In 1884 he established, on his father's estate at Rousdon, an astronomical observatory to contain a 6.4 inch Merz telescope and a transit instrument with other accessories. With the aid of his assistant, Mr. Charles Grover, he began a systematic observation of the variation of brightness of long period variable stars, by Argelander's method and on a plan consistent with that of the Harvard College Observatory. On 3 Jan. 1884 he married Augusta Louisa Brodrick, eldest daughter of William Brodrick, eighth Viscount Midleton and sister of Mr. St. John Brodrick, ninth Viscount Midleton (1st Earl Midleton), sometime secretary of state for war. Sir Cuthbert succeeded to the baronetcy and to the estates that his father had bought in Surrey and Devonshire on his father's death on 26 August 1898. He died at Brighton on 6 July 1901 of congestion of the brain and was buried at Rousdon, Devonshire. His wife survived him with two sons and two daughters. His elder son, Wilfrid succeeded to the baronetcy. He was the son of Sir Cuthbert Edgar Peek, 2nd Bt. and Hon. Augusta Louisa Brodrick. He married Edwine Warner Thornburgh (c1880-5 Sep 1959), daughter of William Henry Thornburgh of St Louis, Missouri USA, on 7 May 1913. Sir Wilfred succeeded to the title of 3rd Baronet Peek, of Rouston, Devon on 6 July 1901. He held the office of Justice of the Peace (J.P.) for Devon and the office of High Sheriff of Devon in 1912. He was decorated with the award of the Companion, Distinguished Service Order (D.S.O.) and fought in the First World War between 1916 and 1919 in Mesopotamia. Sir Wilfred was mentioned in despatches. He gained the rank of Major in the service of the First Devon Yeomanry. Their son, Sir Francis Henry Grenville Peek (16 Sep 1916-19 Jun 1996), eldest of three brothers, became the 4th Baronet. The first Chapel dedicated to St Pancras was evidently built by the father of one Aldred (or Alfred) de Doune. A document dated from some time between 1155 and 1157 records that Aldred had, in the presence of his son (the incumbent) and Robert of Chichester, the Bishop of Exeter, given St Pancras to the Abbey of Montebourg in the Diocese of Coutances in Normandy.The living belonged to the Priory of Loders (Benedictine monks, alien house: daughter of St-Mary-de-Montebourg, Normandy founded c.1107, during the reign of Henry I, by Richard Re Redveriis) near Bridport, a cell of the Abbey. In 1382 the chapel was licensed to Hugh de Doune who held the manor of Rousdon. When Henry V (16 Sep 1386-31 Aug 1422) seized Axmouth and dissolved the Priory of Loders it passed to the Abbey of Syon in Isleworth, later to The Crown and then to local gentry. The list of known Rectors dates from 1279 when it is likely that Rousdon became a 'Parish within a Parish'. The Chapel was thatched and about 25 feet long by 13 feet wide. By the late 18th Century the Chapel had ceased to be used and it became a derelict farm building. In 1871-2 Henry Peek built a new St Pancras Church, very small as parish churches go but large enough for the locality and this was used for worship for nearly a hundred years. By 1872 the incumbent was Rev T. B Bartlett to whom the estate had passed. From 1906 Rousdon and Combpyne shared the same Rector, becoming a United Benefice in 1936. Since 1982 Combpyne-Rousdon has been incorporated into the Axminster Team Ministry. Nearby, between Rousdon and Whitlands, there was at Charton (aka Charlton) another small Chapel (also thatched, and 30 ft by 15 ft) dedicated to St Leonard. This was founded by Gilbert de Umfraville who 'gave the Chapel and appurtenances and 16 acres of land' to the Abbey of Montebourg. Monks living at Axmouth were to serve this Chapel three days a week and all feast days. St Leonard's passed to Loders and thence to Syon and the building became ruinous after the Dissolution of the Monasteries. This was the Village School built and endowed by Sir Henry Peek. Almost certainly it was the first school in the country to provide hot dinners - Sir Henry decided that the children needed to be fed as well as taught and introduced 'penny dinners'. The first child in a family paid 5d each Monday, a second child 4d, and so on, and over a seven years' period it was calculated that 110,221 dinners were supplied at a total cost of 107,406 pence. Rosy cheeks and enthusiasm for 'roly-poly and bacon' are recorded in the press, as is a note of a mention in the House of Commons in July 1883. The school closed in 1939 and the building was gifted to the village by Sir Francis Peek (4th baronet) in 1973, it becoming the village hall for Combpyne-Rousdon. Allhallows School (from 1994, Allhallows College) was an independent public school for boys in Devon, in the west of England. It was predominantly a boarding school but with some day boys. The school was founded about 1515 in Honiton, probably as a chantry school where priests taught boys to read Latin so that they could sing in the choir. Later still it became a grammar school for the sons of the local gentry. Its origins in Honiton are the reason former pupils are still known as Old Honitonians. The school was named after its neighbour All Hallows, a roadside chapel for travellers built sometime before 1327 and now the oldest existing secular building in Honiton. By the 1930s there was an increase in traffic through Honiton, which lay on the main route to Cornwall, which became a serious hazard to the school with premises on both sides of the main road. Inevitably not all the necessary facilities were there and though improvement work started this was brought to a halt by the Second World War. The school was not to acquire a proper gymnasium, swimming pool or cricket pavilion until some years after the war. In the two decades after the Second World War the school gained a national reputation in shooting, attending Bisley on a regular basis and winning the inter-schools Ashburton trophy several times. This success was thanks to the work of James Turner who had been a pupil at the school and then after university joined the staff as chemistry master. During the war he had worked on ballistics and he used this knowledge to train a series of first-class shots. He stayed with the school all his life, ending up with a short spell in the headmaster's chair and then in retirement raising funds. He was one of several masters who devoted their lives to the school including G. S. Napier ('Nap') who spent over a hundred terms there after the First World War. Around 1970 the school became one of the first public schools to admit girls and it prospered into the 1980s. However in the 1990s it went into a decline, with the number of pupils decreasing significantly, from almost 300 to fewer than half that number. One reason for this may have been the school's remote location, at a time when parents expected to see a lot more of their children than had been traditional in the old public school era. The school ran into financial difficulty in 1994. A group of Old Honitonians put together a plan and secured some financial backing to attempt a rescue. A new entity, Allhallows College was established as a company limited by guarantee and registered as a charity. The recession of the early 1990s proved severe, and several West Country schools were closed; the same fate befell Allhallows College despite efforts of staff and board of directors. The college was closed in 1998. After the College closed, the Estate and the fabric of the many buildings, new and old, were in a poor state as a consequence of the adverse finances of the College in latter years. "Rousdon was originally developed in conjunction with the village and four outline farms as a family estate in the 1880's from a farmhouse and preaching house/chapel roughly in the position of the Mansion. It was sold in 1938 to The Honiton School and renamed Allhallows College, a boys boarding school, closing in December 1998 and sold in its entirety to Rousdon Estate Limited (REL), a development company, in Autumn 1999. East Devon District Council, the local planning authority initially adopted a somewhat questionable stance of what use the buildings could be put to. Their preferences: institutional/educational, with a fall-back position favouring hotel/leisure and sports use - they were highly resistant and did not wish to support the change of use to a residential estate! However, REL negotiated the removal of all 50's/60's and 70's institutional structures and an overall plan to convert all remaining buildings (whatever their former use ) to self-contained houses and additional selected areas for new houses. A total of 104 houses including sub-division and conversion of existing and new build was eventually achieved. An auction was held in October 1999 to sell the first 17 houses - formerly occupied by members of staff and hence within120 years lifespan, Rousdon went from a private family seat to a private boarding school to a private multi owned residential estate. Over the ensuing 10 years the Estate was developed with new service infrastructure and the subdivision of the existing buildings, briefly: the Mansion to 5/6, Stable courtyard to 10, Farm yard complex to 15, The Gardens to 8 plus 7 new build, West Lodge to 5 with 2 new build. Added to this - the land to the North of the farm yard was developed with 20 houses, the Kennel compound house plus 2 new houses to the South, the original girls house built in the 60's was replaced with 3 houses ,the modest house on the original Observatory site, demolished and replaced with a more fitting country style property. Of the total 104 - 38 are new houses and the remainder conversions and or redesign/rebuild/ refurbishment of existing structures. With the exception of the 20 North Farm Morrish houses, 3 Stowford Homes houses, the Walled Garden houses, Byways and The Retreat, all the other houses: including the new builds at The Kennels, the Gardens and West Lodge were built or subdivided and remodelled for REL by Cliff Real & Son (the Colyton builder) and sold in "shell form", in the majority of cases by auction. It was then left to purchasers to rebuild/refurbish within the confines of the existing structures and in the case of the building plots to follow detailed planning and design that had been granted. The Estate grounds, including tracks, paths (most notably East Drive and the Beach Cliff Path) were created and maintained by the Collier family and their employees who also carried out all the initial clearance and demolition of the large institutional style structures. The general maintenance of the Estate including the filtration plant and drainage systems has also been undertaken by them. Initially REL had a management team on site during the infrastructure installation and sub-division of properties but for the past 7 years it has been run by the management company, administered and accounted for by Jan Palmer, with help and input from Anne, Nick and Julian Collier on the overall maintenance and infrastructure problems. At the beginning of 2014 Judith Ellard and Barry Moore commenced negotiations, on behalf of Allhallows Ltd, to purchase the Estate management company and remaining freehold land assets of REL, once all planning opportunities had been completed. Both have been involved in an advisory capacity with the running of the Estate during the past 7 years and it is therefore highly appropriate that the ownership and administration has been acquired by Allhallows Ltd. The transaction was completed in November 2014. Finally, I personally feel that the overall success of the Estate must be attributed in a considerable part to the individual purchasers that took on the task (and the risk) of redeveloping, rebuilding, modernising or creating the houses, in some cases, from very controlled historic guidelines and planning sensitivities. I hope everyone feels, as I do it, that it has all been worthwhile and a great success. Allhallows will no doubt maintain and improve the Estate with renewed energy and vigour and to that end I wish all luck and good fortune to the Company and all the individual property owners." So, after nearly 16 years after the school closed, the Estate we have today emerged. A logical and natural conclusion is that the Estate once again became a working agricultural farm, home to a significant number of people, incorporated and owned by its residents and shareholders. The circle, one could argue, was complete .